The next morning Juan took us right across the street from the Hotel Libertador to the convent and cathedral of the Dominican nuns of Santa Catalina. The Spanish built this edifice on a sacred Inkan site, Qorikancha (I think it means Place of Gold). A kancha is a stone-walled enclosure entered by a single doorway and may have more than one thatched roofed building inside the enclosure. The Inkas devoted Qorikancha to all the major energies of Nature with whom they interacted: the sun, moon, thunder, rainbow, Pachamama, the sea and perhaps others. Accounts written by the Spaniards abound with descriptions of gold-covered walls, huge sun discs, and life-sized statues of humans, animals and corn plants all sculpted of pure gold which they discovered at Qorikancha! The greedy Spaniards melted down most of these marvelous golden objects. But the Inkans managed to spirit away the largest Sun Disc and it's never been found since! Today only a few of these Inkan temples remain on the Qorikancha site, enclosed by this large convent and cathedral, because the Spaniards also used many of the stones for their own construction projects. First we entered two temples representing the left and right and one in the center representing the place of integration. In this central area is a large stone altar--Juan said it represented the 4 directions. But the cathedral's informative sign assures tourists that this altar was used for blood sacrifices! Juan read it and merely laughed. Opposite these temples sits the Sun Temple. On one wall is a niche with two windows, one above the other. Juan told us this whole niche used to be plated with sheets of gold. In the middle of the temple, beyond this wall used to be a large concave lens lined with gold. At the June winter solstice the sun's rays reflected perfectly on this lens which concentrated them onto the niche where kindling had been laid by the priests. Thus was the fire of renewal lit each year. Embers from this fire were then taken by runners to the near and far reaches of the empire! Next to the Sun Temple is the Moon Temple. This one unfortunately had been mostly torn down, its stones carted away to be used in other constructions. In these two temples we connected again with the energies of the sun and moon. Even though the Moon Temple is practically destroyed, we could still feel the power of the moon's energies that had been concentrated there by the intentions of the priests hundreds of years ago. 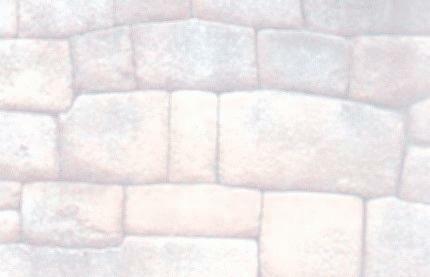 Juan led us outside this edifice to one of the few extant Inkan walls left in Cuzco. This huge wall forms half (one side) of a parabola. It contains a niche where a pure gold statue of a 12-yr-old boy-Inka used to be located--and which the Spaniards in their greed melted down. However, the power is still there, so we connected to it, then pulled in the energies of the temples of the left and right and the sun and moon with which we'd previously connected. We focused those energies in that niche in this stone wall. Standing here by the wall, we looked down into a small park. Many square stones still stand in the park. Juan said that each of these stones was the base for a gold statue! When the Spaniards came over the mountain, the first thing they saw was the blinding sunlight glittering and reflecting off all those statues. How we would have loved to have seen that! Piling into our bus again, we discovered four Q'ero priests sitting in the rear of the bus! I found out later that they'd been walking for about two days down from their village high in the Andes to get to Cuzco to meet us! They were to accompany us on our adventure that day. We journeyed to an Inkan ruin consisting of stone terraces for agriculture. Juan said this was the center that produced potato seeds for the whole Inkan empire! The Inkans planted potatoes each year like we still do today, usually from the 'eyes' of cut-up potatoes saved from the previous crop. But this can be done only for a few years before the growing energies in the tips wear out. So then you have to start from seeds. Since the Inkans were very efficient, they chose this particular place to raise all the potato seeds for the whole empire! After a bit of climbing accompanied by my huffing and puffing, we reached some more ritual baths. Juan pointed to them--the ñust'as of water--teenager, young woman and mature mother. One at a time we and the Q'ero priests entered these baths and connected with the energies of the ñust'as. The mother ñust'a felt the most powerful to me. From these we went to other baths where we women sat in one and pulled silver energies up the base of our spines and out the tops of our heads and into the water; while the men sat in another bath doing the same with gold energies. Then we each sat in the right and left niches of a third bath, connected with these gold and silver energies and then 'baptized' ourselves with the stream of water pouring into the bath. A couple of people stuck their heads under the water stream quickly, too. I 'washed' my hands. The water felt cold, but wonderful. On to the grandmother ñust'a's bath some distance removed from these first three baths and at a higher elevation. All around this bath children from the local village had been playing soccer. Only two adults were with them. The kids had a great time and were very well behaved. Some were sitting along grandmother's bath as we arrived at it. They just moved over to accomodate us. Here we pulled in the energies from all over wherever we'd been. As some of us and Juan commented later, the children's energies helped, too. How appropriate that these 'grandchildren' could play here in these energy fields. Next we went to another set of temples--the left (feminine this time) for us women, the right for the men. After we'd connected with the two different energies, we women went into the center temple, formed a circle and welcomed the men. Forming two circles, this time with the Q'ero priests in the men's inner circle, we women pulled the masculine energy from the men while they pulled our feminine energy from us for integration. Then the Q'ero priests--a very old man, two middle-aged ones and a young one who was in training--made a despacho loaded with all sorts of offerings for the apus. They gave each of us three coca leaves, k'intas, to use as offerings to the 12 apus of the valley plus any apus of our own countries we wished to include in this ritual. I was amused at some of the offerings the Q'eros included in this despacho. They had several kinds of tiny beads and other very tiny man-made objects as well as feathers, sticks, etc. The despacho was bursting at the seams, so to speak, by the time they'd added our k'intas to it and very carefully folded the paper around the objects, then tied the package with a rainbow-colored string. Now it was time to offer red wine and white grape seed liquor to the 12 apus, Pachamama--and ourselves. Normally I avoid alcohol like the plague, as only one sip immediately affects my eyes and makes me dizzy--and if I take any more, I feel myself getting angry. I went 'inside' and asked about the appropriateness of partaking of this particular part of the ritual. I got an ok, just don't sip too much. So when the youngest priest started to pour the wine into the tiny cup, I indicated that I wanted only a tiny bit. Of course, even though he smiled and nodded, I got more than I'd wanted. Pachamama got a pretty big offering from me! I took the merest sip of the wine and also that liquor. Yee gads, but the latter was stee-RONG!!! But I had none of the usual ill effects, just a happy little buzz. While the rest of us hiked back to the bus, the Q'eros hiked up farther to burn the despacho as an offering. But in spite of taking the extra time to do this, they beat me down to the bus! On our way to this site, we'd stopped at a restaurant out in the middle of nowhere, it seemed. One of the Spanish-speaking waiters came aboard the bus and with much translating by Juan, Hendrik and Ali, we all picked out what we wanted to eat. Juan told them to expect us between 2:30-3 that afternoon. The sun was shining brightly that morning. But as we worked our rituals at the site, the clouds began sneaking up on us. It was fairly cloudy when we got back on the bus. Then some very dark large clouds came over the mountain peaks and started following us as the bus traveled along the road in the valley. Eddie and Juan predicted hail and hoped we'd reach the restaurant before the clouds let loose. Thunder rumbled loudly. We could see the restaurant in the distance. We broke out raingear, just in case. We had almost arrived at the restaurant, when the skies opened up and down came buckets of rain--and then very noisy hail! Crashing thunder and blinding lightening spectacularized the show. Perfect timing! The bus pulled under the restaurant's canopy and we quickly piled off the bus and into the room. We were the only customers! The hail made so much racket on the corrugated metal roof that we could hardly hear ourselves talking more than one person away. We got seated and served drinks. Suddenly the roof leaked right on the part of the long table where Juan and some of the others were sitting! They jumped up and we all pitched in to move the heavy wooden table. The waitress mopped off the table and the displaced diners sat down again. The owner in the meantime stuck a big bucket under that leak plus other buckets to catch a few smaller drips here and there. The hail continued to clatter away deafeningly on the roof. We got our orders straightened out and each person got what he/she'd ordered. Absolutely delicious! Many of us had ordered trout with 'limon' (limes)--I ordered that whenever I saw it on the menu, as it was invariably excellent. Most of us ate in silence as it was too difficult to strain one's hearing to make out what a person was trying to say over the non-musical percussion concert. A few folks with ponchos dashed outside, dodging tables to run to the restrooms on the other side of the almost flooded eating courtyard. The owner got out a huge umbrella for another person. But the umbrella was no match for the wind, rain and hail. So the gal who had taken it came back soaking wet. Of course, by the time we'd finished eating, the rain and hail finished falling, the clouds moved on and the sun came out. Hendrik said that the restaurant owner and Eddie had been talking about the damage the hail had probably done to the crops. Hail is the farmers' enemy here in the valley. Back to Cuzco we headed, tummies stuffed, sleepy and contented. That evening we were supposed to meet the four Q'ero priests in one of our hotel rooms, but the hotel management wouldn't allow them up in the rooms! There's quite a prejudice amongst Peruvians of Spanish heritage, the dominant society, against the "filthy, dirty" Quechua-speaking Indians, or runas. Originally this term, runa simply meant "the people" in Quechua. But now when a member of the dominant society uses that word, the meaning is derogatory. However, the indigenous peoples use the term to distinguish themselves from all other people. These priests from the tiny village of Q'ero are Quechuas. Sure, they do drag around bits and pieces of the outside environment on their clothing and they look sort of dirty, but they don't smell and it's 'clean' dirt. Feeling annoyed but resigned, Juan arranged for us to use one of the small lobbies instead. The dominant Peruvians just don't appreciate that it's the Quechuas who've kept alive the Inkan traditions which the world now needs more than ever! We bought the small square cloths for our own mesas from the priests as well as beaded hats, alpaca ponchos, cotton and alpaca blankets and other stuff. A Peruvian guest wandered by, recognized that these were authentic Q'ero priests, so joined in and bought several things from them, too! After the priests finally had packed up and left, at Jeanette's suggestion, we crawled around on hands and knees picking up the bits of twigs and straw, loose pieces of yarn, etc, left by our guests so the hotel management wouldn't be too upset by our frowned-upon activity! It was a little hard getting the yarn to part with the carpet. When we finished, the room didn't look any worse than it had before we used it. And then to bed--the next day would see us visit the Wiroqocha Temple for one of our last rituals. And we invited the four Q'eros to go with us--we gave them 100 soles each for the extra day they spent with us. And four pairs of shoes and assorted t-shirts, jeans, etc that we'd brought from our own countries. Elizabeth Jenkins asks each group to bring clothing and school supplies to share with the Q'eros and also the children who live near the Wiraqocha Temple. Jeanette had collected most of our offerings of this nature and packed them into a large soft-sided extra duffel bag she'd brought for this purpose.